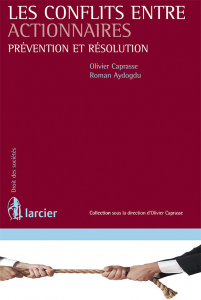 Professor in corporate law at the University of Liège since 2002, Olivier Caprasse has published numerous articles on the subject. In particular, he is the author (with Roman Aydogdu) of the book Les conflits entre actionnaires – De la prévention à la résolution, (Larcier, 2008) and co-director (with Bernard Tilleman) of the Code des sociétés annoté (Editions La Charte). He is also one of the founding members of the Belgian Centre for Corporate Law. In addition to his activities as arbitrator and counsel on corporate law arbitration, Olivier Caprasse draws on his expertise to assist clients in implementing corporate transactions, drafting opinions or representing them in legal proceedings (such as actions for exclusion and compulsory withdrawal, in which he has been involved on numerous occasions). When acting as counsel, Olivier Caprasse law firm’s keyword is flexibility. The costs and the size of the team handling the case (including the potential use of external specialist partners) vary on a case-by-case basis depending on the client’s needs and the issues at stake. Olivier Caprasse always personally oversees each case. Olivier Caprasse specializes in acting as arbitrator or representing his clients in business law arbitrations. As a result of the network which he has developed in academic and legal fields (in Belgium and abroad), Olivier Caprasse, who is also Co-Director of the Commission Royale Droit et Vie des Affaires (CRDVA, see www.cdva.be), also provides assistance to clients on business law questions in general. He works as part of a team with external experts specializing in the subject, the keyword being flexibility. The costs and the size of the team handling the case vary based on the client’s needs. Olivier Caprasse always personally oversees each matter.